On its towering hilltop perch, the Krak des Chevaliers, one of the world's best preserved Crusader castles, held off a siege by the Muslim warrior Saladin nearly 900 years ago. It was lauded by Lawrence of Arabia for its beauty and has been one of the crown jewels of Syria's tourism. But it has fallen victim to the chaos of Syria's uprising and the crackdown against it by President Bashar Assad's regime. Recently, gunmen broke into the castle, threw out the staff and began excavations to loot the site, says Bassam Jammous, general director of the Antiquities and Museum Department in Damascus. Syria's turmoil is threatening the country's rich archaeological heritage, experts warn. Some of the country's most significant sites have been caught in the crossfire in battles between regime forces and rebels. Others have been turned into military bases, raising archaeologists' fears of damage. Regime shelling of neighbourhoods where the opposition is holed up has smashed historic mosques, churches and souks, or markets. Looters have stolen artifacts from excavations and museums. In one of the most egregious examples, shells thudded into the walls of the 12th century al-Madeeq Citadel, raising flames and columns of smoke as regime forces battled with rebels in March. The bombardment punched holes in the walls, according to online footage of the fighting. Looters have stolen artifacts from excavations and museums. “We have facts showing that the government is acting directly against the country's historical heritage,” said Rodrigo Martin, a Spanish archaeologist who has led past research missions inside Syria. What's happening is reminiscent of Iraq's chaos in the wake of Saddam Hussein's 2003 fall, when Baghdad's major museum was looted, and of Egypt, where looting has reportedly increased at archaeological sites around the country in the turmoil since longtime President Hosni Mubarak was toppled last year. An important crossroads, Syria's rich archaeological treasures extend over millennia. The capital, Damascus, is often claimed to be the oldest continuously inhabited city in the world. Archaeologists have uncovered cities dating back 5,000 years to the early Bronze Age, and the country is dotted with “tells,” or hills, that likely hide more such cities, still not excavated. A series of cultures have left their mark - from Biblical civilizations, Alexander the Great's successors and the Romans, to Christian Crusaders and Muslim kingdoms. The heritage also helped fuel tourism that was steadily rising before the crisis, giving a much-needed economic boost. More than 8.5 million tourists visited Syria in 2010, 40 percent more than the year before. Now there are virtually zero. The nearly 2,000-year-old ruins of Palmyra, an ancient oasis city that was one of the biggest tourist draws with towering Roman colonnades and a temple to the god Baal, stand deserted. Government forces have surrounded it and the nearby town and have set up a base in a historic castle on a hilltop overlooking the site, deep in Syria's central deserts. In a report to the U.N. cultural agency Unesco and the EU conservation group Euromed Heritage, Martin and the other archaeologists warned that the troops' fortifications have damaged parts of the ruins. They say there are also reports of looting under the troops' noses - raising the possibility they were involved. “Many groups have attempted to conduct secret excavations, starting by the security forces,” their report said, referring to looting around the country. The archaeologists, who have set up a Facebook page to track reports of damage, say illicit digs have taken place at a number of unexcavated tells and other sites. Besides the break-in at Krak des Chevaliers in March, gunmen have also targeted a museum in the city of Hama, making off with antiques and a priceless gold statue dating back to the Aramaic era, said Jammous, of the government's museum agency. Jammous denied that the army had attacked any archaeological sites and said armed rebels caused any damage. Other sites have been endangered in the crossfire of the daily battles. Several weeks ago, activists in the northwestern province of Idlib said that troops and dissidents battled in and around the ruins of Elba, a Bronze Age city where archaeologists in the 1960s discovered a massive trove of cuneiform tables that revolutionised their understanding of the ancient Mideast. Government assaults on opposition stronghold cities and neighbourhoods -often with shelling and heavy machine-gun fire - have also caused extensive damage. The once bustling covered ancient souk in old Homs, famous for its unusually tall arched roof where people bargained for colourful textiles, rugs, perfumes and clothes, has been heavily damaged. Its walls are now blackened from a fire, its walkways littered with debris and shop shutters twisted and pierced with shrapnel. Traditional Homs houses with arched doorways and inner courtyards have also been bombed. Mosques have served as a launching pad for anti-government protests in Syria, and many have been targeted, particularly in the provinces of Daraa, birthplace of the Syrian revolution, and Homs, an opposition stronghold 80 miles (130 kilometres) north of Damascus. 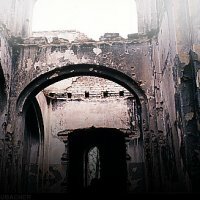 Early on in the uprising, the government targeted the Daraa's Omari Mosque, which was built during the Islamic conquest of Syria in the days of Caliph Omar ibn al-Khattab. Activists say government forces deliberately sabotaged the mosque and hid weapons inside it to prove that armed gangs were sheltering there. Videos show the bombed-out minarets and shell-pocked facades of several mosques and churches in Homs. They include the Umm el-Zunnar church, which was built underground in A.D. 59. In January, artillery fire struck the Sednaya Convent north of Damascus, believed to have been build in A.D. 547, in an attack the government blamed on armed groups.